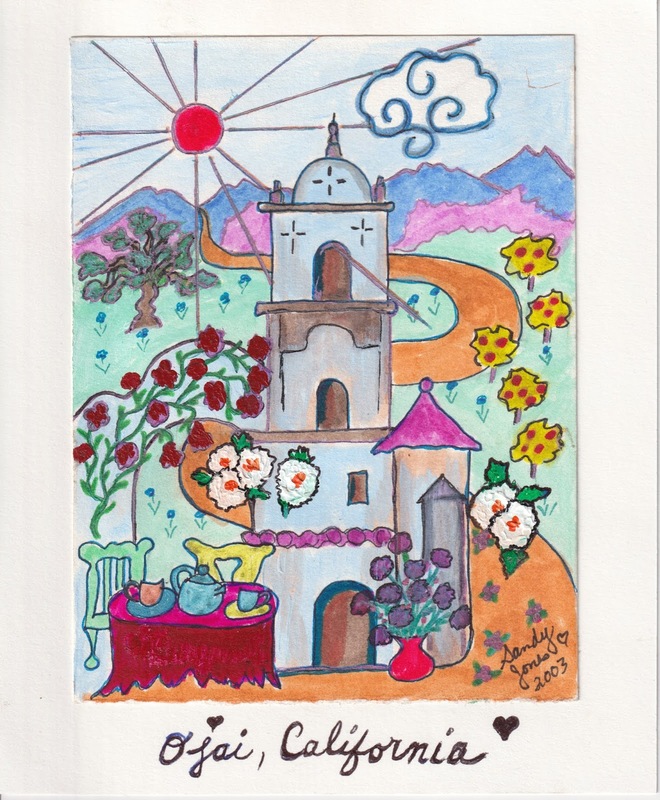 I found this little sketch of Ojai, that I did. It was in an artwork folder with things I’d painted several years ago. It’s rather adorable, I think. So I just felt like sharing it. 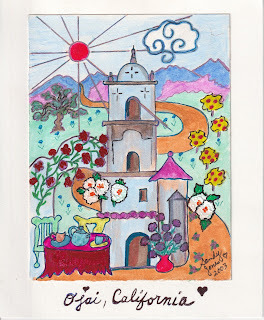 I love Ojai, it is such a lovely home for me. I can't think of a better place to live, in these times, in these days. The little painting got me thinking. I've been very lucky to have lived in such wonderful places. I grew up in Corona del Mar, one of the most beautiful beach towns of California. It was a very special little enclave, many years ago. It's still one of my forevrer favorite places. Then I moved to Maui for a year or two. After that, I went to Aspen, Colorado. I met my husband to be, there. We got married, bought a beautiful, soulful home on a little creek, near the airport, Owl Creek Road. Heaven on earth. We raised our three kids there. What a glorious place that was. Aspen is known for it's blue sky and sunshine, even in the middle of winter. It would snow at night and be bright and magical during the day. I'd ski at least three times a week, all winter long. And the summers were green and lush. Spring time, rivers rushing, clear and icy, roaring with the run off from snowy peaks. Warm summer days, and the cool breeze blowing gently from the mountain tops - we'd always laugh, saying it was like natural air-conditioning. And now, here, in Ojai, back in California, happily ensconced in 'the nest of the moon.' This town is truly sublime. It is, very definitely, a mystical and magical valley. Locals and visitors alike, get to enjoy the creative delights of my little shop, which is such a pleasure for me. And, when I can, I get to play in my rustic, but beautiful, art studio, quietly abiding in the back yard. A sweet little sanctuary for me. And then too, the ever joyful surprises of unexpected friends who often stop by to share their love, their laughter and their beautiful hearts with me. All images and text are original works. Copyright Sandy Jones and/or the respective artists. Picture Window theme. Powered by Blogger.